The search for an alleged robbery suspect on Thursday forced San Bruno police to put a school on lockdown. 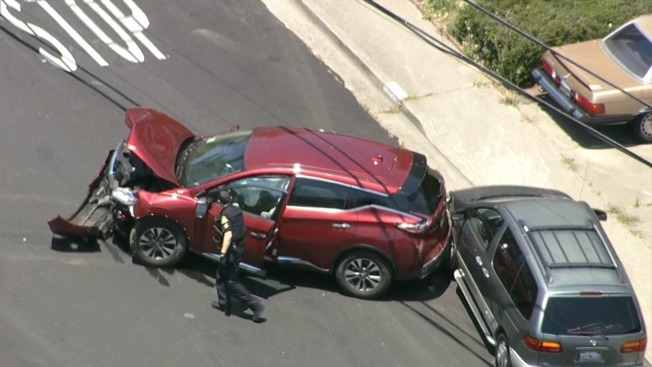 According to the San Bruno Park School District, police were pursuing the suspect when the person crashed into another car near John Muir Elementary School. The suspect was last seen running across the campus around 12:30 p.m.
School is not in session, but there is staff & faculty on-hand, as well as a daycare class, district officials said. Video from the scene showed a wrecked burgundy SUV that had collided with a gray hatchback. No further details were immediately available. It remains unclear if the suspect has been apprehended.